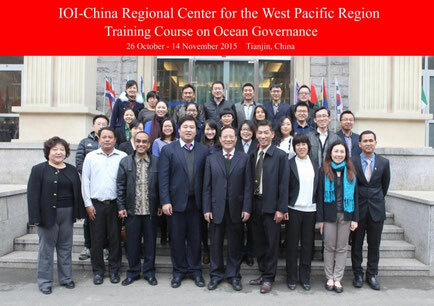 In partnership with the State Oceanic Administration of China, the IOI Training Centre in China organised the sixth edition of the four-week training Course on Ocean Governance for the Western Pacific Region from the 20th August to the 14th September 2018, with the programme being held in Tianjin at the Astor Plaza Hotel. In order to continue making its contribution in marine capacity building for the developing countries in the Western Pacific region, the IOI China Regional Center for the Western Pacific Region successfully implemented again this year the IOI-China Regional Center Training Course on Ocean Governance in Tianjin, China, under the guidance of IOI Headquarters and the leadership and financial support of the Department of International Cooperation under the Ministry of National Resources. A total of 32 mid-career professionals from 8 countries (Bangladesh, China, Egypt, Myanmar, Malaysia, Indonesia, Turkmenistan and Vietnam) participated in the training programme. The training course was implemented through intensive class lectures, discussions and simulation exercises, as well as study tours and field trips, with the purpose of helping the participants get acquainted with the basic knowledge of ocean management and ocean governance, and to encourage them to make their own contribution towards the realization of SDG 14 for their own countries. The training programme also provided participants with a platform for learning from each other, with the participants presenting reports containing good practices from their own countries, highlighting both the challenges they are facing and also current opportunities. The course was again aptly directed by Professor Mao Bin and supported by Prof Qin Li and the staff assisting IOI China. The successful delivery of the course is provided in the latest edition of the IOInforma news bulletin (05/18) available for download here or in the Archive section. The seventh edition of the IOI Course on Ocean Governance for the Western Pacific Region is scheduled to be held from the 19th August to 12th September in Tianjin, China.